Fazilka (Punjab), July 31 (IANS) If a lack of time or resources is preventing you from planting new trees, then it's time you heard of a unique green initiative in this border town of Punjab. To check the rapid decline in green cover, a group of social activists here has launched an innovative 'dial-a-tree' helpline, which will start supplying saplings and carry out plantation free of cost from Aug 1. "We have converted three cycle rickshaws into 'green ambulances' to transport and plant tree saplings at people's doorstep," Chandrika Ahuja, coordinator of the dial-a-tree project, told IANS. "The ambulances will have two trained green warriors each, a variety of tree saplings, manure, cutter and basic equipment for trenching." Fazilka residents simply have to dial 9915184000 and book saplings. 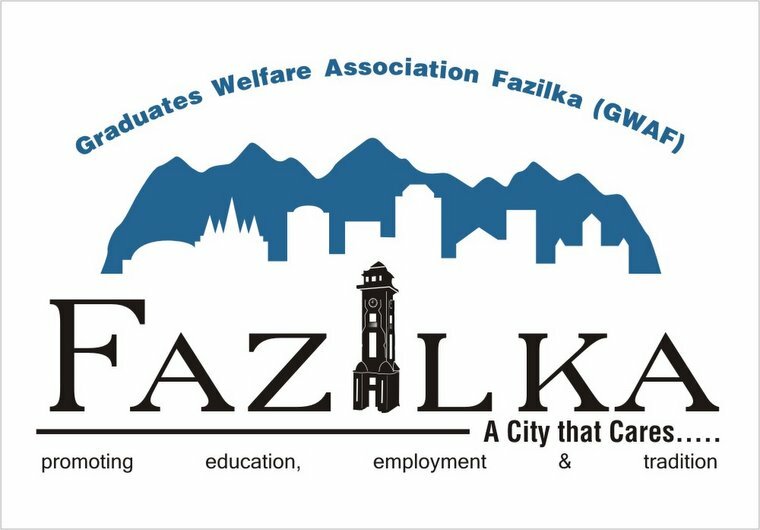 The service has been started by the Graduates Welfare Association Fazilka (GWAF) in association with an agriculture resource centre, Zamindara Farmsolutions, and the Punjab government. GWAF celebrates Aug 1 as Anand Utsav, an annual function organised with the aim of spreading awareness about environmental protection. "This service will be extended free of cost. Trained volunteers will plant the tree and ask the house or land owner to furnish an undertaking that he will protect and take care of the saplings and later they will be awarded with the Green Citizen award," said Ahuja. For bulk plantation at schools and other institutions, GWAF would ensure a free supply of saplings via green ambulances. This service will remain active till Aug 15, India's Independence Day. According to GWAF officials, trees would be planted within 24 hours of a request and besides planting new trees, the green warriors would also assist in maintaining already existing plants. "The dial-a-tree helpline is open and we are getting a whopping response. We will start the plantation drive from Aug 1 and it will continue till Aug 15 as this is the most appropriate time of the year for plantation," Navdeep Asija, secretary of GWAF, told IANS. Talking about the green cover of Fazilka and Punjab, Asija said, "As per information procured through the Right to Information (RTI), municipal authorities in Fazilka had planted less than 800 trees in a decade. About 30 trees survived." He said Fazilka has a 10.4 sq km area under urban settlement and the green belt is less than 0.5 percent. Asija said this is the first time in India that any such service will be launched to save the environment. Fazilka falls in Faridkot district of Punjab, which shares the international border with Pakistan. It is around 250 km from Chandigarh. "We have trained volunteers as green warriors and hope that the public will respond well. Depending on the response we will replicate the model in other towns of the state," said Vikram Ahuja, director of Zamindara Farmsolutions here. The local Graduate Welfare Association Fazilka (GWAF) with the support of other associations and individuals launched the "dial-a-tree" service - first of its kind in the country - to carry out plantation drives in a big way on the doorstep of citizens. Earlier, the town, which has been facing blatant neglect by successive state governments, has made a mark in the field of education, social service and other human welfare activities when various organisations launched eco-friendly rickshaw, set up car-free zone and cyber cafes in localities inhabited by poor people. Three green ambulances would be launched for tree plantation, replacing the dying saplings and treating the injured plants in the town on August 1 to mark the occasion of Anand Utsav, an annual function organised by the GWAF to create awareness among people regarding environment. "The tree plantation as per the demand will start formally on August 1. The Zamindara Farm Solutions and the Department of Forests and Wildlife Preservation, Punjab, have joined hands with us for making this task a big success," said Navdeep Asija, Secretary (administration), GWAF. Chandrika Ahuja, coordinator of the dial-a-tree project, said they converted three cycle rickshaws into green ambulances in service to transport and plant tree saplings. Fazilka: Environmental activists in Punjab are set to launch an innovative "dial-a-tree" service to promote tree plantation and keep the small town green. Already accredited for introducing car-free zone at Fazilka – a small town near the Indo-Pak border, these environmentalists would launch the India's first service of its kind on August 1. 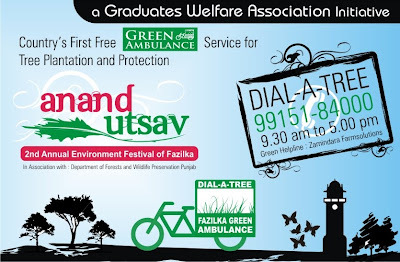 The service is proposed to be launched by Graduates Welfare Association Fazilka (GWAF) on Anand Utsav – an annual function organized with an aim to spread awareness about environmental protection. Zamindara Farmsolutions – an agriculture resource centre has extended support to GWAF for training the volunteers to plant trees and green phone helpline. Department of Forests and Wildlife Preservation Punjab are partnered with us for the same. "Our department is very happy to associate with such unique citizen's initiative" said H.S. Grewal, CF Ferozepur Circle. Chandrika Ahuja, coordinator of Dial-a-Tree project said that they converted three cycle rickshaws into Green Ambulances in service to transport and plant tree saplings at people's door step. These "ambulances" would have two trained green warriors each, variety of tree saplings, manure, cutter and basic equipment for trenching. The service shall be extended to citizen free of cost. The trained volunteers would plant the tree and seek the house or land owner to furnish an undertaking that he would protect and take care of the saplings and later they will be awarded with Green Citizen honour. Anyone, who desires the association to plant a tree on his premises could call up a helpline number or email a request. Vikram Ahuja, director, Zamindara Farmsolutions said that they had been motivating people to plant trees on their birthdays or other special occasions. "We have trained volunteers and hope that public would respond well to the project," he said. The response to already launched Dial-a-Rickshaw project at Fazilka was encouraging and GWAF hoped to replicate the success, said Vikram, who is also one of the GWAF founders. Dial – a- Tree green helpline will start from tomorrow for the pre booking and plantation drive shall be started from 1st of August 2010. Any Fazilka city resident can dial at 99151-84000 and book for tree sapling. For bulk plantation at schools and other institutions, GWAF will ensure free supply of saplings via Green Ambulances. This service will remain active till 15th August 2010. The association promises that the tree would planted within 24 hours following request. Rickshaws had been chosen as "ambulances" since they are non-polluting vehicles. The trained personnel using these ambulances would also take care of existing tress and prevent them from dying. Navdeep Asija, secretary, GWAF said that an RTI query revealed that municipal authorities in Fazilka planted less than 800 trees in a decade. About 30 trees survived. The town has a total 10.4 sqkm urban settlement and the present green belt is less than 0.5 per cent. "It is alarming," he added. "Last year, during Anand Utsav, we planted more than 1200 tree saplings and out of which more than 600 survived; we made it possible through community participation, our idea is not to plant more saplings but to made tree grow with full protection and care", said Dr Bhupinder Singh, Patron GWAF and retired professor from IIT Roorkee. Chandigarh: Hemant Gupta's 30,000-tonne capacity godown for storing foodgrain is one of the largest in Ferozepur, Punjab. In 1978, the Food Corporation of India (FCI) hired it on a monthly rent of Rs75,000, or 50 paise per sq. ft—eventually raised to 80 paise per sq. ft. In 2004, Gupta says, FCI abruptly vacated his godown and stocked the grains in the open nearby. "See the rot within FCI," says an exasperated Gupta. "They won't pay me 80 paise for keeping their foodgrains under the roof, but (they are) allowing (the) foodgrains to perish in the open, for which they are paying Rs1.44 per sq.ft." Open storage means buying two-three times more gunny bags, wooden crates and tarpaulin sheets than what's needed in a covered facility, and fumigation. "It's plain corruption," Gupta says. "The government (is) desperately seeking investment, even eyeing foreign investors...but who will put in money if this is the approach?" asks Gupta. Thirty-two years ago, FCI hired Colonel T.S. Dhillon's 7,500-tonne capacity godown in Chabal, Amritsar, at a monthly rent of Rs15,000, or 40 paise per sq. ft.
Today, he gets 67 paise per sq. ft, or Rs25,125 a month, far below FCI's going rate of Rs2.40-2.50 per sq. ft for godowns set up in 2001-02. "There is no clear policy. Our godowns are as good as others, but we get four times less rates. Are we that illiterate a nation? Nobody could have dared to let a single grain rot in China," says Dhillon, one of the oldest people in this business. "This is definitely an issue," admits Punjab's FCI senior regional manager Nilkanth S. Avhad. "We, too, feel there has to be a uniform policy." The matter is being discussed at the highest level so owners of older godowns get fair rates, he adds. In Punjab, Central and state procurement agencies are accused of whimsical and indifferent functioning when it comes to storing foodgrains. While India reworks its food security Bill to ensure sufficient food for all, wastage of foodgrains during storage and transit or on account of pilferage and theft remains a major issue. Over the past four years, an estimated 600,000 tonnes of foodgrains have been lost due to poor storage, and around 675,000 tonnes in transit. In Punjab alone, 48,315 tonnes of wheat, procured over the last three years, have been declared unfit for humans, ironically by FCI. "Nobody's bothered. In fact, FCI has always promoted open plinth culture," says Sandeep Gilhotra, president of the Punjab Godown Owners' Association. Gilhotra, who himself owns an open storage area with a capacity of 250,000 tonnes in Fazilka, says FCI officers encourage foodgrain storage in the open. He is among 128 investors who put up godowns with a collective capacity of 2.5 million tonnes (mt) in 2001-02 for the Punjab State Grains Procurement Corp. Ltd, which took the spaces on rent on behalf of FCI. These investors are still better off than Gupta and Dhillon as they get a higher monthly rent from FCI. Some of the older investors are considering a rather harsh route: demolishing their godowns. "I told them (FCI officials)...take your stocks out and allow me to demolish my godown so that I could then rent out just the land and still earn more rent," says Dhillon. Over the past 60 years, India has created 80.3 mt of covered storage facilities, but still has 17.8 mt of foodgrain lying in the open. According to Union food minister Sharad Pawar, India urgently needs an additional capacity of another 14 mt. "This would, however, require an investment of Rs4,000 crore. Since it's a big amount, the government is doing it through the public-private partnership model," said a top FCI official, who didn't want to be named. "We expect to create 150 lakh tonnes (15 mt) of storage facility in the next two years." Of this, Punjab alone would be creating about 7 mt of storage facilities by next year, said the state's finance minister, Manpreet Singh Badal. "There's no point getting into a blame game. What we need is to set up more silos in Punjab like the one by the Adani group's 2 lakh-tonne (200,000 tonne) facility in Moga. We've to look ahead." The biggest practiced fundamental right is "Right to Dream", unfortunately this does not hold valid on the present youth of Punjab, they are forced to dream what this glamorous corporate world is showing to them and they are bound to follow it. Mushrooming of medicine shops in each village and transformation of rural villages into urban complex are the few index it. Our SUP, our The Social Structure is damaging, Do we actually need it? charged Pakistan with 42 violations; Pakistan charged India with 26. > At Sundra, a caravansary in the salt wastes of the Thar, Pakistani irregulars were doing their laundry one morning when an Indian 3-in. mortar shell slammed into their midst. Killed: a brown goat. The Paks — camel-riding Indus Rangers and bearded Hur rifle men — ducked behind mud walls and blazed back in the best Gunga Din fashion. A strafing run by Indian Vampire jets failed to dislodge the Pakistanis —indeed, they reported, did not even disturb the vultures circling overhead. > At Fazilka, a farm town south of Lahore, a 100-man Indian company politely asked a band of 1,000 Pakistani marauders to withdraw. At that, claimed the outraged Indians, the Pakistanis opened fire with their rifles. Out numbered 10 to 1, the Indians had no choice but to fight. They killed 59 Paks, while losing only eleven men themselves. cooling-off period was likely to take just as long — or longer. allowed Chandigarh to remain the capital of both states. this time unless Chandigarh was given unconditionally to the Punjab. No matter what Mrs. Gandhi decided to do, trouble was bound to follow. A controversy has erupted over the issue connected with the collection of water samples by a team of Punjab Pollution Control Board (PPCB) led by its chairman Rajat Aggarwal from the river Sutlej flowing near this village. While the residents of this village alleged that officials of PPCB did not enter into the river and asked the children playing at the spot to collect water samples for them, Deputy Commissioner, Ferozepur, KK Yadav, who accompanied the team, claimed that samples of water had been collected in a professional manner by the team members. Yesterday, a battery of engineers and scientists led by Aggarwal descended on this village, which remained in limelight of late due to the fact that residents of this and its neighbouring villages have been suffering from various ailments due to consumption of polluted water, to collect water samples for laboratory analysis of the same. The residents said that PPCB engineers and scientists must have taken water samples on their own instead of pressing the children into service for the same task as the children did not know how and from which point water for sampling must be collected. They added that the PPCB team must have collected water samples before the monsoon rains as due to rains, the water flow in river Sutlej had increased and it had taken a major quantity of pollutants away. They said that they were not aware of the report of laboratory analysis of water samples taken from the same spots in the past few months by different agencies of state government. Yadav said that residents of village were levelling baseless allegations. He said that collection of water samples would be a continuous process so that a comprehensive analysis of water could be made for further action. The Deputy Commissioner said that the Army and the BSF authorities had been involved in this process and they had been asked to report the matter to him immediately whenever they found discoloured, stinking and smell emanating water in river Sutlej so that its samples could be taken without any delay for laboratory analysis. बठिंडा : राज्य के मालवा क्षेत्र के पेयजल में यूरेनियम व हेवी मेटल्स की मानक से अधिक मात्रा के मामले में काफी ना-नुकुर के बाद अंतत: राज्य सरकार हरकत में आ गई है। मुख्यमंत्री प्रकाश सिंह बादल ने स्वास्थ्य विभाग को भाभा आटोमिक रिसर्च सेंटर (बीएआरसी) मुंबई के सहयोग से पेयजल की विस्तृत जांच करने को कहा है। गौरतलब है कि फरीदकोट के बाबा फरीद सेंटर फॉर स्पेशल चिल्ड्रन ने जर्मनी की माइक्रोट्रेस मिनरल लैब की मदद से मंदबुद्धि बच्चों के बालों के सैंपलों में यूरेनियम होने का खुलासा किया था। वहीं, गुरु नानक देव यूनिवर्सिटी (जीएनडीयू) अमृतसर के फिजिक्स विभाग ने भी मालवा के पेयजल में यूरेनियम की तय मानक से अधिक मात्रा का खुलासा किया था। इसके बावजूद सरकार ने इसे नहीं माना। कुछ दिन पूर्व जब राज्य मानवाधिकार आयोग में पंजाब प्रदूषण कंट्रोल बोर्ड (पीपीसीबी) और पंजाब यूनिवर्सिटी चंडीगढ़ ने संयुक्त जांच रिपोर्ट में कबूला कि बठिंडा के नेशनल फर्टीलाइजर्स लिमिटेड (एनएफएल) और थर्मल प्लांटों के नजदीक के पानी में यूरेनियम की मात्रा तय मानक से अधिक है, तो सरकार को आखिरकार इसकी जांच के लिए तैयार होना ही पड़ा। खास बात यह है कि मालवा क्षेत्र में बढ़ते कैंसर और अपंगता के लिए भी यूरेनियम व दूसरे हेवी मेटल्स को जिम्मेदार माना जा रहा है। ऐसे में सरकार पर इतना दबाव बन गया कि उन्हें जांच के लिए तैयार होना पड़ा। लेकिन हैरानी यह है कि स्वास्थ्य विभाग किसी तरह की जांच करने से पहले मुख्यमंत्री को तीन माह पूर्व की गई जांच की रिपोर्ट भेजने की तैयारी में है, जिसमें यूरेनियम व दूसरे हेवी मेटल्स का स्तर सामान्य पाने का दावा किया जा रहा है। राज्य स्वास्थ्य निदेशक डा. जेपी सिंह ने इस संबंध में मुख्यमंत्री के आदेश मिलने की पुष्टि करते हुए कहा कि कोई जांच और बीएआरसी से संपर्क करने से पहले वह सीएम को तीन माह पूर्व की गई जांच रिपोर्ट भेजेंगे, जिसमें सब कुछ सामान्य है। अगर मुख्यमंत्री दोबारा जांच को कहते हैं तो वह बीएआरसी से तालमेल कर विस्तृत जांच करेंगे। उधर, यूरेनियम मामले की मानवाधिकार आयोग में पैरवी कर रहे रिसर्च सह डायरेक्टर नहरी व पावर पंजाब के पूर्व चीफ इंजीनियर डा. जीएस ढिल्लों ने कहा कि भले ही स्वास्थ्य विभाग पानी में यूरेनियम व दूसरे हेवी मेटल्स की मात्रा सामान्य होने का दावा कर रहा है लेकिन आज तक कभी वह यह नहीं बता सके कि मालवा में कैंसर का ग्राफ इतनी तेजी से क्यों बढ़ रहा है और गांव के बच्चे अपंग क्यों हो रहे हैं। इसलिए इसकी विस्तृत जांच करवानी जरूरी है। जीएनडीयू, अमृतसर के फिजिक्स विभाग के वरिष्ठ प्रोफेसर डा. सुरिंदर सिंह ने पिछले दिनों रिलीज की अपनी जांच रिपोर्ट में कैंसर के लिए पानी व दूसरे खाद्य पदार्थो में यूरेनियम और दूसरे हेवी मेटल्स की मानक से अधिक मात्रा के जिम्मेदार होने की तरफ इशारा किया था। खास बात यह है कि मालवा के पेयजल में यूरेनियम की घातक स्तर तक मौजूदगी के बाद खुद मुख्यमंत्री भी अपने पैतृक गांव बादल के पानी की जांच करवा चुके हैं। इसमें फ्लोराइड की मात्रा अधिक होने के अलावा सब कुछ सामान्य आया लेकिन पंजाब में सुविधा न होने की वजह से इसमें यूरेनियम के स्तर की जांच नहीं हो सकी। संभव है कि यूरेनियम व हेवी मेटल्स की विस्तृत जांच पर जोर देने के पीछे यह बड़ा कारण हो .. Known for Asia's biggest wool market in pre-partition days and Fazilka jutti (footwear) and its five Padma awardees in the post-partition days, this border town has also made a mark in the field of education. Seven students of this one of the oldest towns of the country have been selected for different courses in different colleges being run under the aegis of the Indian Institute of Technology (IIT) this year. "Producing seven candidates for various courses being run by the IITs from this border town, having a a population of about 70,000 is a rare achievement," claimed a section of residents while talking to the TNS. The residents also demanded that the town must be equipped with all the facilities by the state government after taking its potential into consideration as four students made it to various IIT last year also, they added. Information gathered by the TNS revealed that those students, who were likely to get admissions in various IITs as per their all India ranking included Sumay Gupta, Karan Singh, Rajan Verma, Agam Kalra, Kuldeep Uttam and Gaurav Gulbadhear. One local girl, who did not wish to be named, had been selected for a doctorate course in the IIT. Information revealed that most of the students, who had made it to the prestigious institutions this year, did not take special coaching from the coaching centres being run in different parts of the country as they preferred to prepare in their hometown only. Information revealed that about five students of this town are likely to get admission in the MBBS in different medical colleges of Punjab as they had cleared the PMET test conducted by the Baba Farid University of Health Sciences (BFUHS) this year. One other student had cleared all-India medical entrance test. "Persian meaning of "Fazil" is "learned person" and Fazilka is a town of learned people. Young ones, who hail from Fazilka, are trying their level best to maintain the sanctity of the meaning of name of their town," said Bhupinder Singh, patron, Graduate Welfare Association Fazilka (GWAF). Fazilka, which can boast of having witnessed a revolution in the field of education in 1904 when the first primary school, namely, Arya Kanya Putri Pathshala, was set up here at the time when education for girls was looked down upon, got its first degree college in 1940 and it was set up in the memory of a philanthropist Munshi Ram by his kin. Though the town faced perpetual neglect by the successive governments of Punjab, its residents kept making a mark in various field by braving all odds and the town managed to earn a niche for itself at the national level in various spheres. "Though the GWAF has not played any role in the achievement made by the students of Fazilka this year in academic fields, we are planning to do something, which can help in producing more doctors, engineers, army personnel and scientist,"said Navdeep Asija, secretary (administration), GWAF. It's an alarming situation in Punjab, the granary to the nation, where heavy pesticide usage in the fields is taking a toll on the reproductive health of the people. "Rising instances of abortion, early menarchy, foetal abnormalities especially neural tube defects and early ageing seem to have a strong correlation to the high pesticide levels in our fields," said Dr GPI Singh, director principal, Adesh Institute of Medical Sciences, Bathinda. Confirming the trend, retired government medical professional in Patiala, Dr Amar Singh Azad said high levels of pesticide used in the fields have now entered the food chain and are adversely affecting the reproductive health of the locals. "Cases of premature birth, birth defects, erectile dysfunctions, ovarian cyst, uterine fibroid and number child-less couples are on the rise in the state," said Dr Azad. Concerned over the disturbing trend, farm activists like Umendra Dutt of the Kheti Virasat Mission, have written to the central government to intervene in the matter and take immediate steps to reduce the usage of pesticides in the fields of Punjab. "We did bring the matter in the notice of the state government but nothing has happened so far because there are no published figures," said Dutt. Farm experts said high usage of pesticides and fertilisers is a legacy of the green revolution, which increased the productivity of Punjab farmlands significantly and provided food security to the country. It is only in the last decade that the ill effects of these farm practices started showing on the health of the people due to the presence of environmental toxins. The problem is more pronounced in the cotton growing Malwa region of the state involving districts like Bathinda, Sangrur, Ferozepur, Fazilka and Muktsar. Experts said the cotton crop requires high doses of pesticides. Data related to usage of pesticides in Punjab, which has around 1.5 per cent of the land area of the entire country, as against the big states indicates the alarming trend. In 2004-05, Punjab consumed around 6900 metric tonnes of pesticides against 4520 mt in neighbouring Haryana, 6855 mt in UP, 1628 mt in Rajasthan, 749 mt in MP and 3030 mt in Maharashtra. 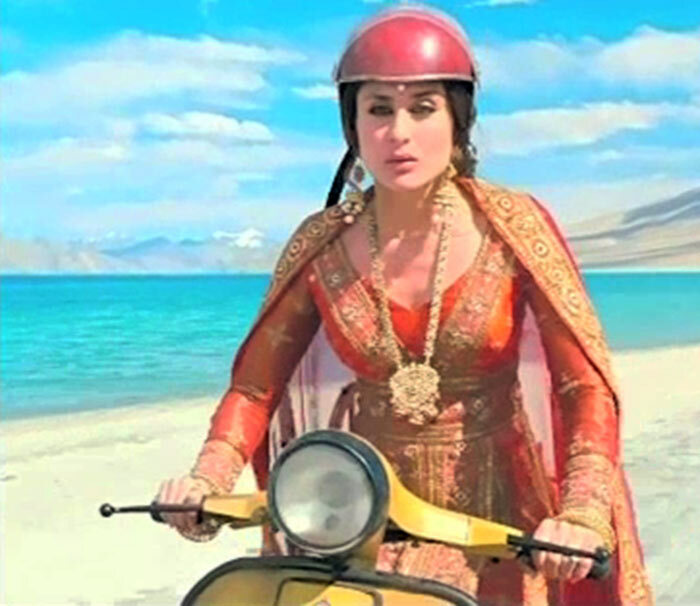 Chandigarh: Film actor Kareena Kapoor's vintage style and her red crash helmet as she rides a scooter to meet Amir Khan in the final sequence of the Bollywood blockbuster '3 Idiots' appears to have achieved the impossible in Punjab. The predominantly Sikh state, where most women two-wheeler drivers have conveniently used religious faith as a pretext to avoid wearing helmets because this inconveniences them and spoils their hair dos, is witnessing a sudden and unprecedented demand for the old style 'Kareena Kapoor wala laal rang ka' half helmets. Even in cities like Amritsar where traffic constables are deliberately lackadaisical in enforcing the helmet rule for fear of treading on religious sentiments, young women are competing with each other to be the first to own the suddenly stylish headgear. Shops in Chandigarh's scooter markets are again out after having replenished stocks many times since the release of the film. The curious trend has come as a "happy surprise" for IIT Delhi alumnus, Mr Navdeep Asija, who is a traffic management expert and had been searching for strategies to best promote the use of safety helmets amongst women in Punjab. "Thank God! Girls have realised that the head is more important than skin or the face," he said profusely thanking the producers of "3 Idiots" for having achieved the impossible. Notwithstanding the fact that the little red helmet is more a fashion statement and possibly not produced to the best quality or safety standards, Mr Asija says the very fact that Punjabi women – Sikh and non-Sikh alike – are using protective headgear "is nothing short of a miracle!" Asija has himself gone out and purchased ten such helmets as gifts to young girls in his own home town of Fazilka, where he and his friends have been actively promoting highly successful green strategies like the ecocab or radio cycle rickshaw service. To thwart nefarious designs of forces inimical to India, the Border Security Force (BSF) authorities have set up four layers security arrangements on the Indo-Pak border. For the first time, the existing three layers security setup has been strengthened by one additional security layer. This exercise has been undertaken as the intelligence inputs have revealed that terrorists' outfits operating from Pakistan could destabilise the peace process initiated by the governments of both India and Pakistan through the ongoing foreign secretaries level talks and coming foreign ministers meet in July 2010. Official sources said under four layers security setup, the BSF troops had been deployed in close vicinity of the Zero Line, in the area falling between Zero Line and the cobra fencing, alongside the cobra fencing towards Indian side and about 800 metres deep inside the Indian territory in the border pockets. "Moreover, the incidents connected with unprovoked firing in Simbal Skol area in Gurdaspur, rocket firing in Amritsar and unprovoked firing in Fazilka sector a few years ago do not allow us to use any kind of laxity while protecting the Punjab frontiers," pointed out DIG, BSF, Abohar sector, Vimal Satyarthi. "Additional troops have been mobilised from the battalion headquarters to make the four layers security setup a big success. The women constables have been given the task to maintain vigil on the border in a professional way while extending all comforts to them during the duty hours," he disclosed, adding that the senior functionaries had started visiting the forwards areas regularly. Satyarthi said four layer security arrangements would be a permanent feature on the border. "The security layer erected deep inside the Indian territory, at a distance of about 800 metres from the International Border (IB) is being used to keep a watch on the movements of strangers and suspicious elements in the border areas. This security wall is helpful in stopping the unscrupulous elements including smugglers and their couriers to reach near the IB," he added. The residents of Fazilka and nearby areas are deprived of the "justice at doorstep" principle laid down by the judiciary and the government. Prime Minister and Law Minister have repeatedly announced to provide justice to the general public and poor litigants at their doorstep. However, it proved to be hollow as far as the residents of Fazilka are concerned, alleged president, Fazilka Zila Banao Sangharsh Samiti, chairman, Rajesh Kumar Angi in a press-release here today. He said the district headquarters of Ferozepur is situated at a distance of about 125 kilometers. To cover such a long distance is not only expensive but inconvenient also for the public. Angi further pleaded that Fazilka is geographically suitable to make the district headquarter because it is situated at an equal distance from both the sub-divisions of Abohar and Jalalabad. Fazilka is one of the oldest sub-division of Punjab. Abohar and Jalalabad sub-divisions were earlier the part of this sub-division. Former president of the Bar Association, Angi, alleged that the successive government and leaders of all the parities have betrayed the people of Fazilka as they never made effort to provide any relief to them. Rajesh Kumer Agni urged the CM of Punjab, Parkash Singh Badal, to declare Fazilka a district headquarters otherwise the Samiti would re-launch their agitation. The body of Jarnail Singh, a jawan of the Central Reserve Police Force (CRPF), who laid down his life while fighting the Maoists in Chhattisgarh on Tuesday, was cremated at his native village Badha, one kilometre from here, today with a guard of honour. soul. 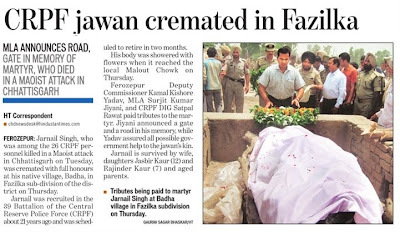 Jarnail Singh was recruited as sepoy in the 39 Battalion of CRPF about 21 years ago. A sea of humanity descended on the cremation ground which rented with repeated raising of slogans like 'Bharat Mata Ki Jai' and 'Jab Tak Sooraj Chand Rahega, Jarnail Singh Tera Nam Rahega.' People were scrambling to have a last glimpse of their hero. The body was brought to the village in a flower bedecked truck from Malout. A number of youths, who were on motorcycles, were leading the funeral procession. and waved the Indian tricolour when the body was being taken to the cremation ground from the house of Jarnail Singh. DIG, CRPF, Sat Pal Rawat, Ferozepur Deputy Commissioner KK Yadav, Surjit Jiyani, MLA, Fazilka, Mohinder Dhingra, chairman, Improvement Trust, Anil Sethi, president, municipal council, Ajay Sood, SDM, Fazilka, Devinder Sachdeva, a political leader and senior functionaries of the police attended the funeral. survived by his parents, wife and two teenaged daughters. Jarnail Singh was among those CRPF personnel who were killed by the Maoists by laying down an ambush in the thick jungle area of Narainpur-Raipur districts of Chhattisgarh while they were returning to their base camp after executing the road opening task on Tuesday. The DC said he would write to the Punjab government for extending financial help to the next kin of the family of the deceased. A pall of gloom descended on Badha village situated on the outskirts of Fazilka when the news of the killing of one of its residents Jarnail Singh, who was a sepoy in the CRPF, by Naxals in Raipur district of Chhattisgarh on Tuesday, spread in the village. The deceased's nephew, Baljeet Singh, received a phone call from Chhattisgarh late last night from associates of Jarnail Singh in connection with his death in an ambush laid down by Naxals in the Mahimagabdi area, which was about 3 km away from the base camp of CRPF jawans at Thodai in Raipur district. However, no official of the state government had reached to his house till the filing of the report. Jarnail Singh is survived by his parents Hansa Singh and Veera Bai, wife Jagir Kaur and two teenage daughters -Jasbir Kaur and Rajwinder Kaur. Baljeet Singh said Jarnail was recruited as a sepoy in 39 battalion of the CRPF about 21 years ago.He said though he had been making calls to number from where he received the call last night to know about the whereabouts of the body of Jarnail Singh, no one responded. He said that so far, the family had not received any message in connection with the death of Jarnail Singh from the CRPF authorities. Ferozepur, Punjab: Following reports that tonnes of hazardous chem- icals being discharged into a Sutlej channel by tanneries in Pakistan were polluting irri- gation and drinking water in border villages in the Hussainiwala area, the Health Department has taken water samples from these villages to examine their heavy metal con- tent. There are about 200 tanneries in Kasur town of Pakistan, bordering Hussainiwala, which discharge toxic heavy metals like mercury, lead and chromium into a Sutlej channel. This untreated water is used for irrigation and drinking by villagers of border areas. "We have been facing this problem for 25 years. This is not the first time that water samples have been collected," said Jagir Singh (62) of Jhalee Ke Uttar, a border village. 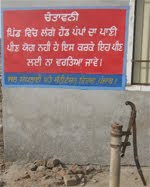 Malkit Singh of another border village, Bhanewala, said they had no option but to drink the brackish water drawn from hand pumps. "Often, dead fish are found floating in the channel, but the authorities have never taken it seriously," said Satnam Singh (75) of Jhalle Ke Uttar village. Ferozepur Health Officer Dr Rakesh Sirki said water samples in the border villages had failed the test on earlier occasions. "We have constituted special mobile teams to visit each and every village and dissuade people from using water from the Sutlej channel," he said. Deputy Commissioner Kamal Kishore Yadav said a detailed report in this regard had been sent to the state government. On the level of contamination of water in Teja Ruhela, another border village of Fazilka subdivision, the DC said the Pollution Control Board report had ruled out the presence of heavy metals. He admitted that water drawn from shallow handpumps was particularly polluted. "We have sent a proposal to the state government for 450 ROs for border villages," he said.